“I felt a great disturbance in the server population, as if 400,000 voices suddenly cried out in terror and were suddenly silenced. I fear something terrible has happened.” I’ve dramatised it a bit, you know to add the colour and verve so often missing from gaming financial figures, but from the high of February, when EA claimed Star Wars The Old Republic had 1.7 million active subscribers, it’s now dropped to 1.3million. Those numbers don’t have EA panicking, it seems. According to EA chief John Riccitiello it’s “very much in line with our original assumptions”. How so? President of the EA Games Label, Frank Gibeau, says it’s all part of the “billing cycle”. A certain percentage of people who bought the game in the fervour of launch aren’t renewing, leaving the game with a core subscriber size of around 1.3 million, a number they hope to increase. They’ve been using free weekend and buddy passes to pull in more players. 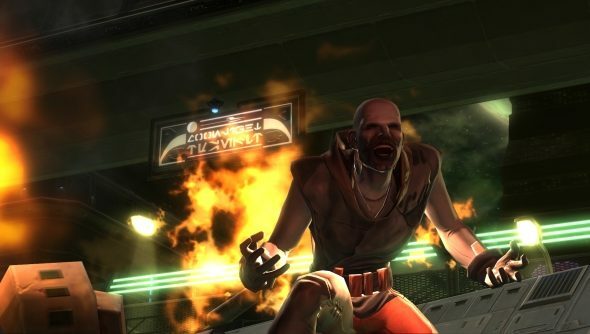 The next year will be an interesting journey for SWTOR, particularly given the server populations they have. I’m fascinated that someone would launch a traditional, subs based MMO when the money is rolling in with free-to-play. Particularly one that relies more on story-content over sandbox play: you’d think that a game that actually has storied endings to character’s journeys would appreciate that the players paying via subs would get more frustrated waiting for that content. It’s a slog to make a questline in SW:TOR, but that’s what they have to do to make content for the game. Even the daily quests that they’ve been running that have been getting more interesting, are not the reason people play a Bioware game. But 1.3 million is not a low number: it only looks low in comparison to the frightening numbers that World of Warcraft commands. If they can keep the servers costs down, and a sever merge is probably on the cards, SW: TOR is unlikely to suffer the fate of the younglings, but I do worry about its ability to significantly grow.